Updates requiring an appliance reboot or the interruption of services are excluded from the automatic update process unless you check the box to include them. It is not mandatory to use this Check for Updates feature. If your appliance is not internet-facing or if your organization's security policy does not allow for automatic update functionality, you can manually check for updates. 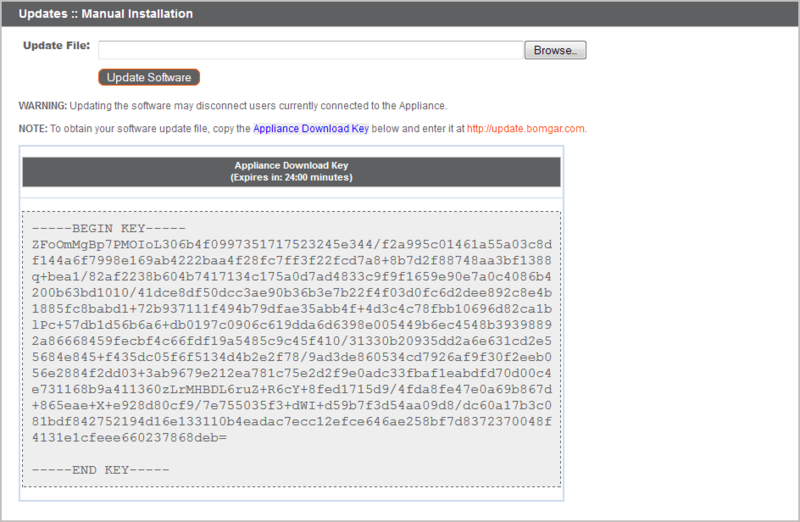 Click the Appliance Download Key link to generate a unique appliance key, and then, from a non-restricted system, submit that key to BeyondTrust's update server at https://update.bomgar.com. Download any available updates to a removable storage device and then transfer those updates to a system from which you can manage your appliance. After downloading a software package, browse to the file from the Manual Installation section, and then click the Update Software button to complete the installation. When the BeyondTrust End User License Agreement (EULA) screen appears, fill out the required contact information and click the Agree-Begin Download button to accept the EULA and continue the installation. If you have multiple appliances with the same site configuration (either for failover or for ATLAS) you will only need to accept the EULA once. If you acquire your updates via download.bomgar.com, the EULA acceptance process is identical.